Revenue in the Music Streaming segment amounts to US$4,357m in 2019. Revenue is expected to show an annual growth rate (CAGR 2019-2023) of 3.3%, resulting in a market volume of US$4,957m by 2023. User penetration is 56.0% in 2019 and is expected to hit 59.3% by 2023. The average revenue per user (ARPU) currently amounts to US$23.63. In global comparison, most revenue is generated in United States (US$4,357m in 2019). Music Streaming services, e.g. Spotify, Deezer or Apple Music, offer unlimited access to their content libraries either for a monthly subscription fee (without any advertising) or ad-supported, with forced commercial breaks between the tracks. Music can be streamed to various connected devices. Internet radio or video streams (e.g. YouTube) are not included. Reading Support Revenue in the Music Streaming segment amounts to US$4,357m in 2019. Reading Support The Music Streaming segment is expected to show a revenue growth of 3.9% in 2020. Reading Support In the Music Streaming segment, the number of users is expected to amount to 200.9m by 2023. 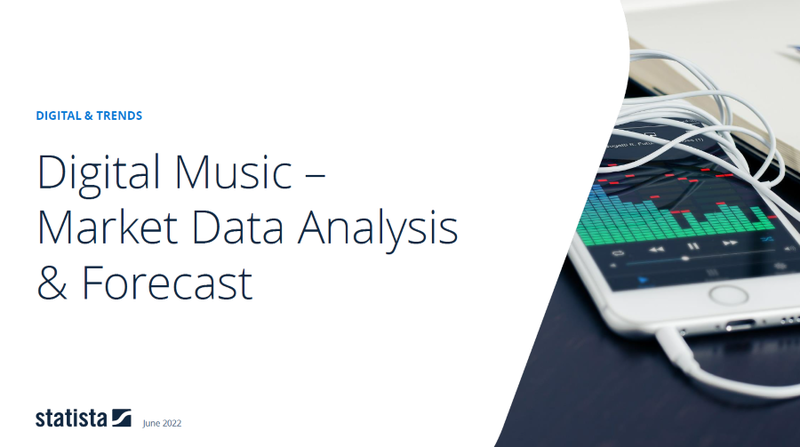 Reading Support User penetration in the Music Streaming segment is at 56.0% in 2019. Reading Support The average revenue per user (ARPU) in the Music Streaming segment amounts to US$23.63 in 2019. Reading Support With a market volume of US$4,357m in 2019, most revenue is generated in United States. Reading Support With a rate of 56.0%, the user penetration in the Music Streaming segment is highest in United States. The “User Penetration” tab shows a comparison of user penetration rates for 50 of the world’s leading digital economies in the selected market (market segment, region) and year. Here you can find more studies and statistics about "Music Streaming".